My rooster and hen have spots on their combs. Can you please tell me what this looks like to you? I sent a picture. We had a similar photo, same question recently. I can't see the details of the photo clearly enough to know what this might be. It could be dried blood from aggressive chicken behavior or from the chickens scratching at something irritating their combs. Mosquito bites can be very irritating as well as mites. 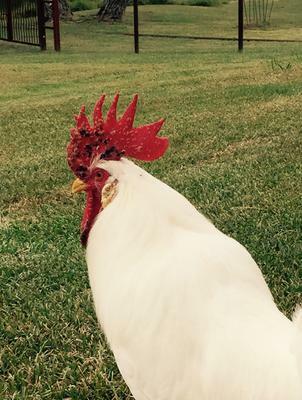 The feathering looks beautiful on the rooster, can't tell if there are any blood stains around the comb on feathers. There are possibilities of a fungal infection, or bacterial infection, but your rooster looks very healthy from what I can see. I'd suggest gently washing the combs to see if the spots will wash off. You can use an antibiotic ointment to promote healing and might want to consider screening in your chicken coop windows to keep mosquitoes out (if you have mosquitoes in your area). Chicken combs can be the only part of their bodies with exposed skin where a mosquito could bite them. Chicken flocks are actually used as bait to find out what mosquito born diseases might be present in an area. Recent tests of these flocks in my area show there is Bubonic Plague present, traced to squirrels carrying the disease. The chickens generally don't get sick from disease infected mosquito bites. There are literal Chicken Pox diseases that can cause discoloration of combs, but sometimes it's just dried blood.